« My favorite adult only all inclusive resort in Mexico, Secrets Capri! 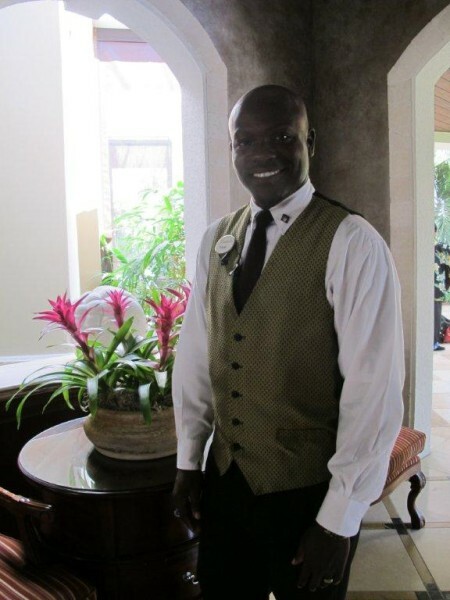 Sandals butler service – what does a butler do & how much do you tip? Standard rooms are the least expensive and start with the entry level room. These rooms have all the features you’d expect including a king bed, A/C, blowdryer, bath amenities, safe, iron and ironing board plus a mini fridge stocked with water, soft drinks and fruit juices, all complimentary. You may or may not have a balcony in an entry level room and room service is not usually offered. Club level rooms add bathrobes and a fully stocked in room bar with wine, beer, champagne, liquor and mixers. There’s a club level lounge with free WIFI and other services plus a concierge to assist with check in, spa, tour and restaurant reservations. Almost every club level room has a patio or balcony, many have beautiful ocean views, some are beachfront, some have whirlpool tubs and room service is normally included. Sandals Butler suites are another step up with the very best locations plus special features like a private pool and outdoor jacuzzi (skinny dipping anyone?) such as the Romeo and Juliet suite or Sunset Bluff Millionaire’s Villa with panoramic oceanview from the bed, living room and huge private pool deck. Talk about the life! Other butler suites are located directly on the beach such as the two story beachfront villa with pool on Exuma or romantic Beachfront Rondoval with private plunge pool and whirlpool in St Lucia. Still more are Swim Up Suites such as those at Sandals Negril, Sandals Royal Caribbean and brand new Sandals La Source in Grenada. At a family friendly all inclusive Beaches Resort, your butler can do all of the above plus provide a stroller, entertain your kids with a zoo full of towel animals, bring plates of warm chocolate chip cookies, arrange front row seats for the Sesame Street parade, help with kids club logistics and make sure the whole family is pampered and has the time of their lives. So that all sounds good and you decide to book a butler suite. How much does it cost, how does Sandals butler service work and how much should you tip a butler at Sandals? Cost will depend on the which Sandals Resort you choose, when you travel, how long you stay and the suite you select, but there are affordable butler suites and extravagant butler suites with costs from about $3-14K for a one week all inclusive stay for two. Sandals butler service begins long before you arrive at the resort with a personalized preference form covering every aspect of your stay from food and beverage, to preferred activities, special requests and more. At your destination airport the VIP treatment continues and upon arrival at the resort your butler will provide a preprogrammed cell phone and orientation to the resort. Two or more butlers work as a team to provide service 7 days a week from early morning to late evening and are “on call” as needed. Your butler will also check in several times each day to ensure your needs are met, anything requiring advanced plans is arranged and reservations are coordinated. At the end of your stay your butler will assist with check out, luggage and airport transfers. At Sandals and Beaches Resorts tips are not allowed but butlers are the exception to that rule and most guests find $20-40 day an appropriate amount. Guests making extensive use of butler services may consider a higher amount and guests that rarely interact with the butler may be comfortable with a nominal tip. Butler tips may be paid in cash directly to your butler(s) but most Sandals and Beaches guests prefer to add the desired amount of gratuity to their room bill and pay by credit card at checkout. An important note – butler tips may be split evenly or proportionately based on services rendered. And my personal advice from numerous butler experiences – there is absolutely no reason to pay part of your tip up front to secure good service. Your butler wants to please and will work hard to make your trip special and memorable. So check out the specials and deals, call or email our specialists for advice and help choosing the best Sandals Resort, or book online. Then get out and create your own butler service experience. Once you try it you won’t go back! Should I Upgrade My Room At Sandals?